MK Miki Zohar's bill would see Israel labeling products from countries that label Israeli products. In response to the European Union’s plan to label Israeli products manufactured in Judea and Samaria, MK Miki Zohar (Likud) has submitted a bill to the Knesset that would see products from countries that label Israeli products being labeled themselves. “We will label every product which comes from a country which is boycotting us. I think it would be appropriate if the public knows that the country that sends the product to us is daring to boycott us," Zohar told Arutz Sheva about his initiative on Sunday. "We need to show the world that we are determined and not apologizing, but rather saying that it is our right to keep the Land of Israel and prevent the establishment of a Palestinian state," he continued. "The fact that they are trying to associate our ideological thoughts with all kinds of boycotts, we can answer that with an eye for an eye and a tooth for a tooth." He downplayed any problems with the EU which may result from such a step, saying that we must not forget that Israel is a great consumer, in addition to it being a giant when it comes to technology and science. Zohar said he recommends that Israel clarify to the Europeans that the boycott will also cost them the Israeli know-how in areas such as high-tech. 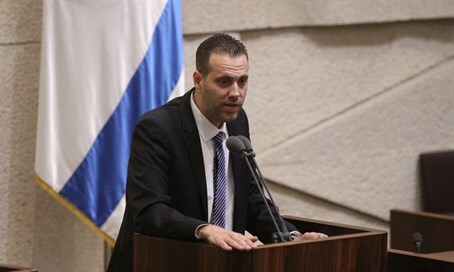 Nevertheless, Zohar expressed hope that the bill will not be needed because the EU countries will come to their senses and cancel the labeling plan. He added that his proposal has received very positive resonance in the Knesset. Speaking at a press conference in the Barkan Industrial Region in Samaria, where Israelis and Palestinians work side-by-side, Hotovely stated that - despite EU officials' insistence - labeling Jewish-made products was a form of a boycott. "Today the Foreign Minister is starting a battle against the idea of labeling," she said. "Labeling, it's very clear to say... it's a clear boycotting (of) the State of Israel." Hotovely noted that targeting one specific region of Israel was essentially tantamount to "boycotting the State itself and creating delegitimization of the State."